Examining ways to improve the forecasting of drifting objects and substances at the ocean's surface. Dr. Dumont and his team are examining ways to improve the forecasting of drifting objects and substances at the ocean's surface. 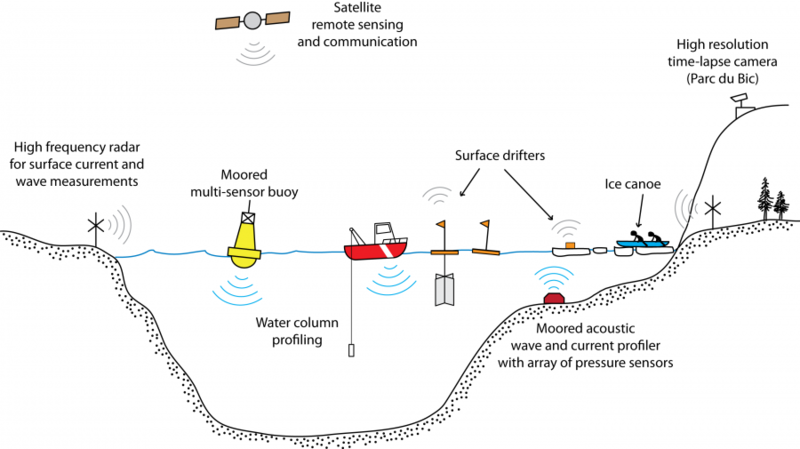 The movement of surface water and sea ice is challenging to observe and model, so Dumont is combining new and old techniques including satellites, small boats, drifters, buoys, ice canoes, high-resolution time-lapsed cameras, and local knowledge. Responding to marine emergencies in harsh, ice-infested coastal environments is challenging: survival time is shorter and conditions can be extremely difficult. This interdisciplinary and multi-sectoral initiative is improving surface forecasts, building the capacity to use the improved tools, and document the process for subsequent use elsewhere. With SLGO staff and end-users, an application that allows the visualization of surface currents measured by HFR in real-time was successfully created and implemented (http://ogsl.ca/conditions/). Through collaborative work, the first ever New generation Oceanographic Variable buoyancy Autonomous (NOVA) profiling float in coastal waters of the St. Lawrence Estuary was successfully deployed, enabling testing of the device in new operating conditions and providing invaluable data to verify the forecasting system, paving the way to a future St. Lawrence-Argo program. A study looking at how a passive floating tracer would disperse if released from the Old Harry prospect site was published. This study was recognized as one of the 10 scientific discoveries of the year 2014 by the Quebec Science magazine, was featured in the October 26th 2014 edition of the Découverte TV science show, was seen as a new paradigm in decision-making by Boufadel and Geng (2014), and helped secured additional funds to study the impacts of hydrocarbon on marine ecosystems. The large media coverage of this research led citizens to launch a locally-funded surface drifter program in Baie-des-Chaleurs that team members supported with expertise. Twenty-four buoys were acquired and deployed in the region providing more than 8000 data points that have been compared with simulated trajectories to assess the validity of the forecasting system. This project also studies how social representations of the marine environment affect decision-making and the development of response strategies to hazards and long-term changes. In terms of modeling, working with international collaborators improved wave-ice physics with the WAVEWATCH III wave models and these improvements have been included in the last public release. The Pic Champlain photogrammetric observatory was used to carry out novel waves-in-ice sampling work from an ice canoe, demonstrating that the St. Lawrence Estuary can advantageously be used to tackle questions pertaining to the marginal ice zone dynamics. Tremblay,Bruno,Williams, J., R. Newton, R. Allard . 2016, Dynamic preconditioning of the Minimum September sea-ice extent, J. Clim, 10.1175/JCLI-D-15-0515.1..
Bourgault,Daniel,Chavanne,Cedric,Dumont,Dany,E. Morin, P. Galbraith, L. Gostiaux. 2015, Le point sur les marées d'équinoxe dans l'estuaire du Saint-Laurent, Nat. Can., 10.7202/1034101ar. Tremblay,Bruno,Hata, Y.. 2015, A 1.5D Anisotropic Sigma-Coordinate Thermal Stress Model of Sea Ice: validation against an Ice Stress Buoy deployed in the Canadian Arctic Archipelago, J. Geophys. Res., 10.1002/2015JC010820. Dumont,Dany,Smith,Greg,Tremblay,Bruno,. 2015, A basal stress parameterization for modeling landfast ice, J. Geophys. Res., 10.1002/2014JC010678. Tremblay,Bruno,Hata, Y.,. 2015, Anisotropic internal thermal stress in sea ice from the Canadian Arctic Archipelago, J. Geophys. Res., 120, 5457–5472,10.1002/ 2015JC010819. Chavanne,Cedric,Halverson, M., R. Pawlowicz. 2017, Dependence of 25-MHz HF Radar Working Range on Near-Surface Conductivity, Atm. Ocean Tech, 10.1175/JTECH-D-16-0139.1..
Hernandez-Diaz,Leticia ,Laprise,René,O. Nikiéma and K. Winger. 2017, Dynamical Downscaling with empirical correction of sea-surface conditions: Application to a CORDEX Africa simulation, Clim. Dyn., 48, 2215-2243,10.1007/s00382-016-3201-9. Chavanne,Cedric,Dumont,Dany,. 2015, Experimental assessment of the performance of high frequency CODAR and WERA radars to measure ocean currents in partially ice-covered waters, J. Atm. Ocean Tech., 10.1175/JTECH-D-15-0143.1. Bourgault,Daniel,Dumont,Dany,Plante,Steve,Archambault, P., C. Grant, R. Audet, B. Bader, G. Brisson, M. Castonguay, M. Cusson, S. Doyon, B. Jean, S. Lamalle, Y. Lambert, V. Lesage, M. Levasseur, N. Lewis, É. Pelletier, C. Régis, I. Schloss, G. St-Onge, G. Therr. 2016, Notre Golfe : l’émergence d’un réseau multisectoriel pour l'étude de l'environnement socioécologique du Golfe du Saint-Laurent, Nat. Can., 140(2), 41-44,10.7202/1036502ar. Bismuth,Eliott,Caveen,James ,Neumeier,Urs,Senneville,Simon,Ruest, B.. 2015, Recent wave climate and expected future changes in the seasonally ice-infested waters of the Gulf of St. Lawrence, Canada, Climate Dynamic, 10.1007/s00382-015-2592-3. Improved models will better predict the movement of sea ice, and help improve the protocols used to protect people and the environment. This will lead to improved emergency response(s) to hazardous marine situations like oil spills and lost ships in Canada’s harsh, ice-infested coastal areas. 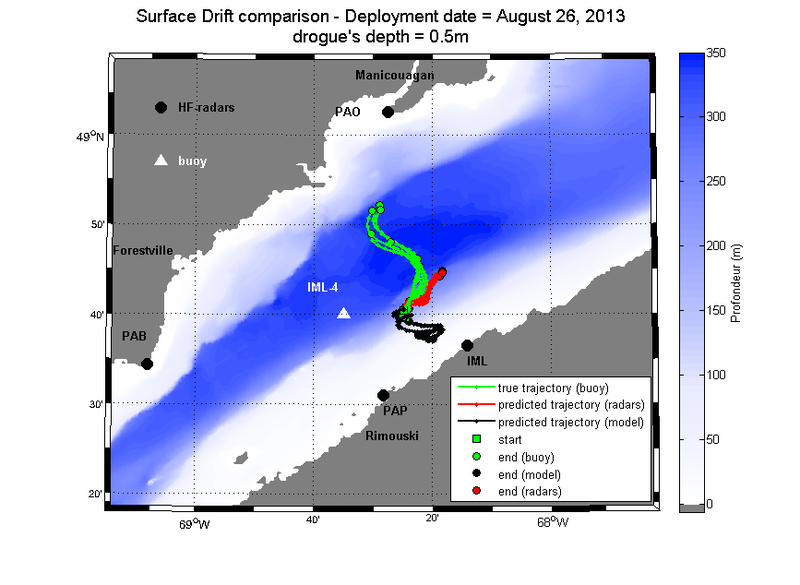 Through a unique collaboration with the SLGO staff and end-users (those who will eventually use these observations), Dr. Dumont successfully created and implemented an application that allows the visualization of surface currents measured by HFR in real-time. Buoys were deployed from ice canoes, attracting unexpected attention to sea ice in the gulf and the estuary. The demonstration of the use of ice canoes for coastal research was awarded the Saint-Laurent Prize, and has provided the basis for going further. Ice canoes can go safely in sea ice even if they are agitated by waves, which allows researcher to grasp these phenomena like never before (or like Shakleton or Nansen expedition crew members). Dr. Dumont hopes to acquire a canoe used specifically for research work, a first of its kind. The large media coverage of this collaboration led citizens from Baie des Chaleurs (Gaspésie) to contact the project and express their concerns vis-à-vis the projected Belledune oil port of Chaleurs Terminal. One year later, Dr. Dumont and his team initiatiated a citizen-driven and locally-funded surface drifter program in Baie-des-Chaleurs. 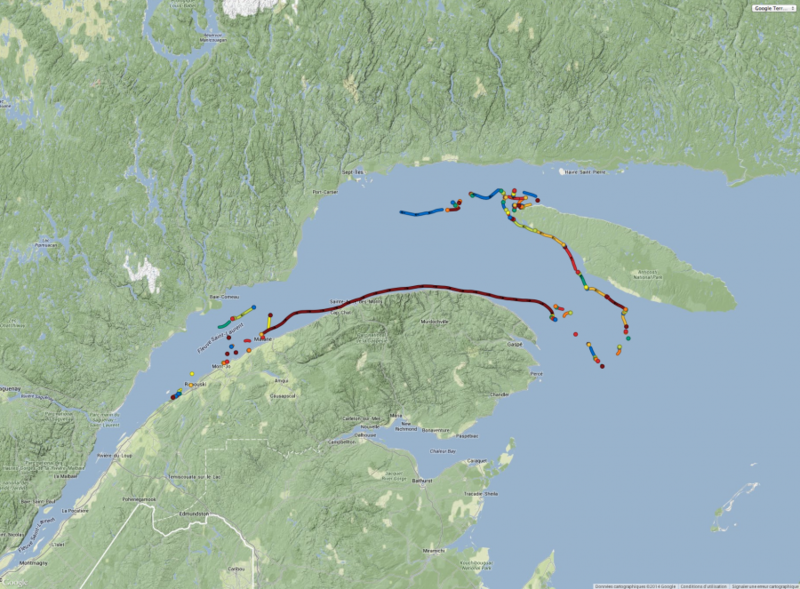 Twenty-four buoys were acquired and deployed in Baie-des-Chaleurs providing more than 8000 data points. The comité ZIP Baie-des-Chaleurs played a key role in coordinating the project while Marc-André Bernard, an engaged citizen from Maria was instrumental in initiating the project. Wave-ice interactions from this project were include in WaveWatch III and simulated for the time wave conditions in the EGSL using sound wave-ice physics. This effort was made possible by MEOPAR and attracted other funding from the Canadian Space Agency and Environment Canada. Installed the Pic Champlain coastal observatory in 2014, in order to better understand hwo waves and sea ice interact in so-called marginal ice zones. After two seasons of data gathering, the team captured half a dozen break-up events. 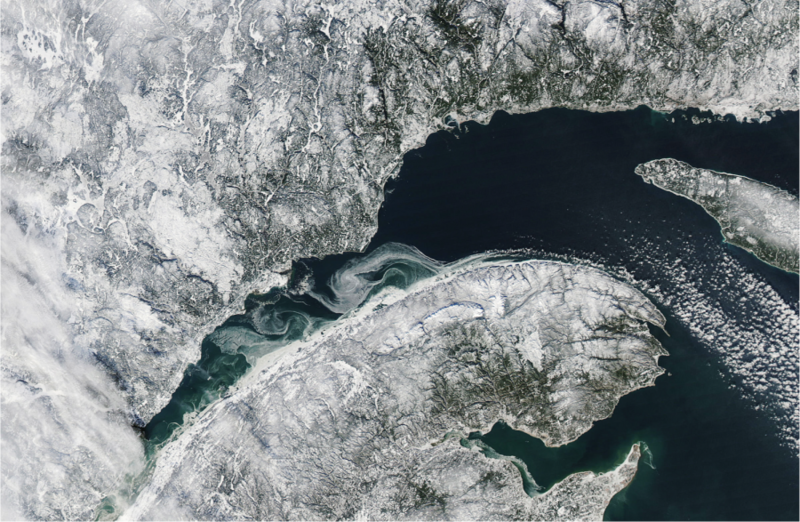 Analysis of these images show in great detail how the floe size distribution (FSD) evolve. The observatory served as a bases for a similar one that was installed near Pond Inlet, Nunavut. Deployed the first ever autnomous NOVA profiling float in coastal waters of the St. Lawrence Estuary. Data is now shared internationally in near real-time through the Global Telecommunication System (GTS) used by all national marine forecasting services. View a PPT about Dany Dumont's research. How the ice canoe team launched MEOPAR buoys. Follow Dany Dumont on Twitter. UQAR-ISMER - page web de Dany Dumont en français.